The leather is a wonderful material, to see, to touch, to listen, to smell. Full of poetry, sensations and possibilities. By using this material, time seems to stop and suddenly our senses are awaken. Mat, shiny, velvet, thick, thin, plain or with grain. It´s interesting to explore and combine with other materials, in order to create contrasts of textures and colors. SOLA uses nappa leather for the outside and suede leather for the inside, both revealing the purity of it. 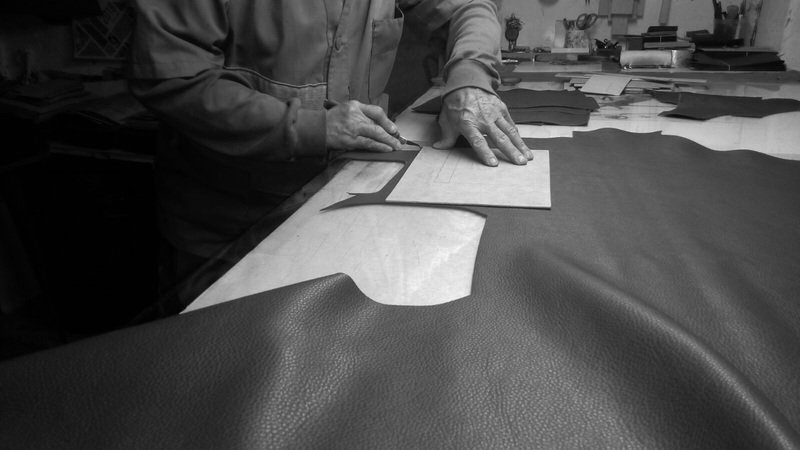 The leather is meticulously selected by Spanish craftsmen who guarantee “l´héritage du savoir-faire”. SOLA bags and accessories are molded in a smooth and soft nappa from the best tanners with the greatest care and precision, to create a quality and long lasting product. Bags are manufactured in an Ubrique´s atelier (Spain), reference place for the luxury leather goods making in Europe. Pattern makers & craftsmen share with humility and generosity their knowledge, in each piece they achieve with more than 30 years of experience. Dedication, skills, and commitment combined with natural materials, allows to make a unique object with integrity and soul.The development process involves time to design and to manufacture. The traditional craft means looking back over to hand made work and consuming an impeccable product made with time, love and respect. However, progress is also beautiful and necessary to integrate into the process of making luxury leather goods through new techniques of construction or using special machines. That´s innovation, taking values from the past and catapulting them to the future.